Derek: Need to go home? Derek: Maybe if you cry you'll feel better. Meredith: I... you just... just you being here is... and don't say anything. Just be here. That... that helps. How are you? Alex: Meredith, we need you. Arizona: I have a kid in there, 15 years old, previously healthy. Has back pain bad enough to cause vomiting. Can you talk it through with me, cause I can't figure out what it is and I think best out loud. Bailey: Did you not about George O'Malley? Arizona: I did. It's incredibly sad. Bailey: I cannot talk to you right now. I cannot work right now. Arizona: Dr. Bailey, I hear that, and I don't mean to be insensitive but, this kid... this kids still alive. And I don't know what's wrong with him, not a clue. So, I need you to work. I need you to talk through this living patient with me Bailey. Please. Bailey: How's his neuro exam? Bailey: Could it be a compression fracture? Arizona: Plane films and CT are negative. Callie: What about his heart? Callie: Ok. His eyes? I know... don't wanna imagine him without his eyes. 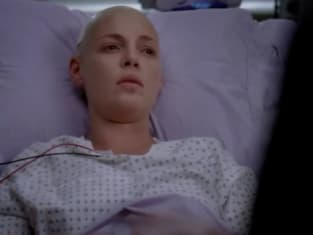 Izzie: George would give everything. His skin, his eyes, he would give everything. Izzie: (on phone) George, it's me. You know, I pretty much died not too long ago so I need you to call me back. Please. I know, I played the cancer card. I'm gross. Whatever. Alex: I need to tell you something, and I need you to not panic. I need you to keep breathing. I need you to stay alive. I swear to god, I need you to stay alive. Alright? Alex: O'Malley, he got in an accident. He's brain-dead. Callie: She's strong enough. She's strong enough, and you have to tell her. Alex: Why? It can wait. Callie: No! It can't. It can't wait because George's organs are not gonna be viable for long. If they want to use them they have to do it soon and I have to decide if they get to use them. And, I need Izzie to help me, because she's the one who should decide. She's who should decide. So that's one reason. And... the other reason is... Karev, if you let them unplug George without giving her a chance to say goodbye, I mean it, she will never forgive you. You have to tell her! Arizona: I'm so sorry. I just heard. I don't know what to say. Go home, you need to go home. You need to cry and scream and... When my brother died I ate doughnuts. I ate a lot of doughnuts and that helped some but, god. I don't... I don't know what to say. Callie: His Mom wants me to decide about his organs. He lost his wallet in the accident. They don't know if he's a donor and now his Mom wants me to decide, and I can't. I can't tell her no, but I can't decide. I mean, we were only married for a few months. Arizona: Ok. But, during those months you were the most important person in George's life. Mrs. O'Malley: You were his wife. In God's eyes you're still his wife. You should decide about his organs. You should decide. Mrs O'Malley: I can't. I can't do it Callie. Mrs O'Malley: I can't do it. You understand? Ronnie and Jerry are off on some fishing expedition in Alaska and they're gonna come home and I have to tell them that Georgie... That's all I can do. It's all I can... I can't. I... I can't even see him like this. I can't. You need to do this for me. Can you do this for me? You people answer your pages! George O'Malley jumped in front of a bus today. He knew what he was doing and he did it anyway. And he did it to save a life. So, I'm not gonna allow you doctors to stand here. There are lives on the line. There are lives we can save. So, if George O'Malley can jump in front of a bus, we can answer our damn pages. So, lets go. (everyone leaves) Damn it. Damn it O'Malley. Meredith: He grabbed my hand, and he squeezed it, and he wrote with his finger. Derek: He wrote with his finger? Meredith: You know... in my hand! He wrote 007. Bailey: Wh... Give me... Ok... what did I write? Bailey: No! No I did no write Joe! Everyone: Are you serious? It could not be him? How do you know? Richard: Did anyone try and call O'Malley? Can we get him on the phone? Meredith: I'm telling you he squeezed my hand. Bailey: Shut it! You don't get to talk anymore. You don't get to talk ever again. Meredith: I could have sworn it was George. Cristina: I got his voicemail. Callie: He has a freckle on his right hand, it's shaped like Texas. I used to tease him about it. I'll check. Lexie: Who said that was George? Why do we think that's George? Callie: Meredith said... I don't know. Lexie: That's not George. Look... look at his feet. Look how tall he is. That's not George. Alex: You can't tell her! Alex: She coded in my arms. Out of nowhere, she died. Just... I'll tell her. I'll tell her when she gets stronger. Izzie: I had a dream. He was in his uniform. Izzie: George is gonna die in the army if we don't stop him. Hand me my phone, I need my phone. Amanda: John Doe, the guy who threw me out of the way of the bus. The guy who saved my life. Everyone's crying and they keep saying "John Doe is George." Who's George?